"All homeless veterans have found housing in Montgomery Co.," a WTOP.com headline declared on December 15, 2015. "No veteran is homeless in Montgomery County, officials announce," a Washington Post headline blared six days later. Montgomery County had "found a home for every homeless veteran," NBC4's Jim Handly assured viewers at 5:45 PM the same day. Then-Councilmember George Leventhal was widely quoted and toasted by obsequious local media, just months after he had been condemned by homeless advocates for his attempt to criminalize panhandling by the homeless on County streets. He and the Council were understandably seeking to change the narrative. Change it Montgomery County did - with eager help from their cheerleaders and Fellow Travelers in the local media. 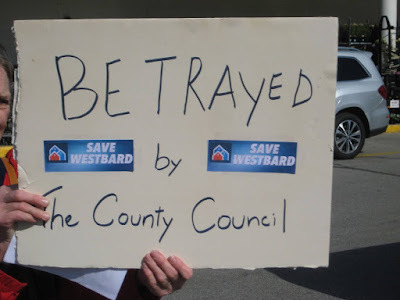 While actual homeless advocates working in the community would be the first to acknowledge the claim was impossible, and that it was based on a belief that there would be available housing units in the future as homeless veterans were identified, that is not how the County's elected officials and their buddies in the local news media promoted it to the public. Montgomery County government "Paperless Airplane"
The shameful, false claim that there are no more homeless veterans in Montgomery County was trotted out again by County officials Monday. 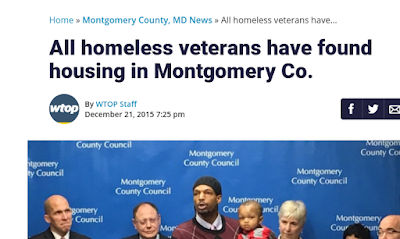 A press release boasted that "Montgomery County was one of the first communities to reach 'functional zero' for veterans’ homelessness in December 2015. 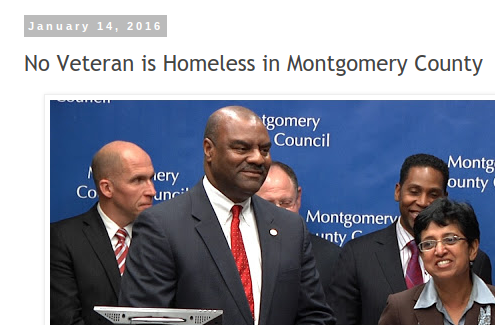 Since January 2015, Montgomery County has permanently ended homelessness for 148 veterans." No one in the local media pushed back on the false claim this time, either. I've now confirmed that there are indeed homeless veterans on the streets of Montgomery County, and ironically, I came across one due to the failure of our County Council to provide a functional master plan highway system. Last week, I spent 90 minutes traveling between Bethesda and Shady Grove due to an accident-related backup on the Beltway and I-270. Along with many other frustrated drivers, I exited to Old Georgetown Road, to begin a red-light-at-every-intersection crawl north. Lo and behold, when I arrived at the intersection of Old Georgetown and Rockville Pike, there was a homeless man panhandling in the median. He was holding a sign that read, "Homeless Veteran." We all know he is not the only one. 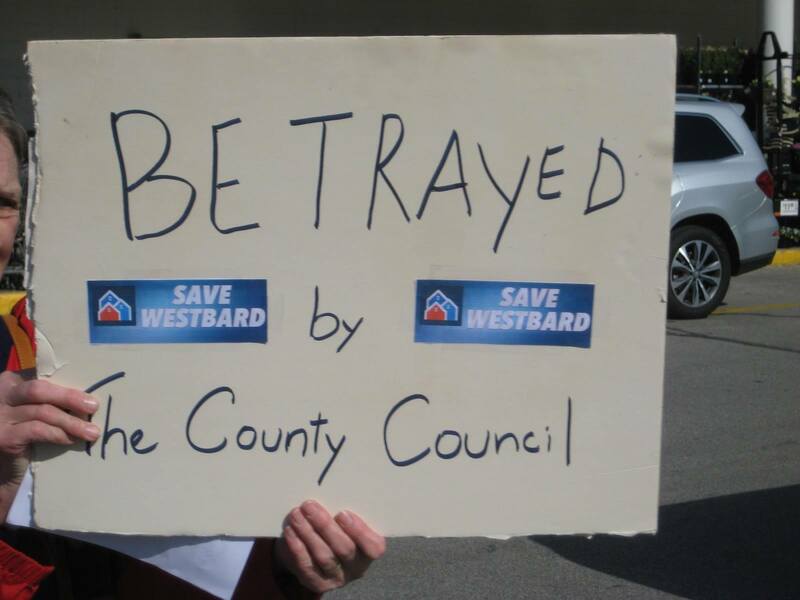 But the County is putting a $10 billion Bus Rapid Transit boondoggle, a $1 million-a-year Ride On Extra carrying one passenger in each direction, tax cuts for developers, and millions in kickbacks to supporters and campaign donors in the "non-profit" community ahead of our great veterans. Fact check: Although the latest false claim easily earns a Four Pinocchio rating, the ongoing mendacity of our corrupt elected officials has required me to follow the Washington Post in adopting the new "Bottomless Pinocchio," which it describes as "a new rating for a false claim repeated over and over again." Sigh. Sean Hannity (and before him Bill O'Reilly) have done research and say there isn't a homeless problem for vets and those that are want to me that way. I think Sean has also said the myth of homeless vets is a product of the DEEP STATE. So who am I to believe? Is this a problem or not? Who is telling the truth? Fox News or the DEEP STATE? How do you know that the individual you saw panhandling was really a homeless vet? Haven't you heard enough stories about how panhandling at major intersections is often a big scam that is dominated by the more aggressive beggars? This is as silly as your freak out about low ridership on Ride On. You see one person begging for money one time and assume EVIL COUNTY CARTEL. For all we know the guy begging for money wasn't even a vet and as 11:11 AM said he might have been a scammer. For heaves sake get a job, a hobby.. do SOMETHING with your time instead of driving around town making up drama every place you go.